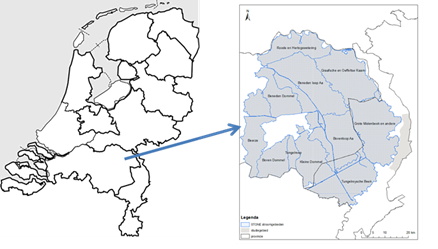 The study site ‘de Peel’ is located in the southeast part of The Netherlands with the region being constrained by the river Meuse in the north and east (Figure 1). It covers an area of flatland of approx. 2500 km2 with elevations ranging from 10 meters in the northeast bordering the river Meuse, to a maximum of 50 meters a.s.l. in the southwest. The centre of the circular shaped study site area with a radius of approximately 25 km has coordinates 51° 32’19 N, 5° 51’05 E. The region has a temperate sea climate with a mean annual temperature of 10.5°C and mean annual precipitation of 775 mm. Figure 1. Location of Study area ‘ de Peel’. The area has a very mixed but intensive agricultural land use. Dominant land use is a mix of arable and vegetable production and intensive grassland. The main farming systems are intensive dairy production, intensive vegetable production and intensive arable production. The region also has many farms for intensive pig production which are mainly fed with imported concentrates. Intensive dairy and pig production are causing a high input of manure and slurry on the land. The high manure and slurry input, together with the intensive production of grassland, crops for roughage, arable and vegetable crops are causing a high nutrient input into the environment. Sandy soils are very susceptible to nitrate and phosphorus leaching into groundwater. Legislation from the EU-nitrate directive is increasingly limiting nitrogen input. Therefore, there is a high need amongst farmers to improve their Nitrogen Use Efficiency (NUE). Improvement of soil quality is considered a possibility to improve the NUE. The intensive land use and the narrow rotations are also causing considerable problems with soil pathogens like pathogenic nematodes. Together with the ban on metam natrium and other soil disinfectants there is high demand for new management options to improve soil health. Intensive land use, the high degree of mechanisation and often crops that are harvested late in autumn (like silage maize) are placing additional demands on the soil thereby directly impacting upon soil structure and subsoil compaction. The main soil type is sand to sandy loam with an organic matter content ranging 3 to 10%. Soil quality monitoring in practice involves regular (once in about 4 years) monitoring of soil nutrient status for N, P, K and micronutrients, pH and soil organic matter. Depending on the crop type and identified soil health problems, there is regular monitoring for specific pathogenic nematodes and other soil borne pathogens. Assessment of cation exchange capacity (CEC) and soil biological indicators, are only occasionally used but are rapidly gaining interest. The study area has been intensively studied on various aspects of soil quality and related ecosystem services. At a central location in the area is the DLO experimental farm at Vredepeel. This experimental farm represents the centre for research, demonstration and communication for agriculture in the region. The experimental farm has several mid to long-term experiments focusing on soil quality. Management options like organic matter management, soil tillage and soil health treatments are scientifically tested, either separately and or in combination. Various research and demonstration projects with farmer networks and/or pilot farms on various aspects of soil quality have been or are running in the study area. The networks have been focusing on various soil aspects including nitrate leaching, phosphorus accumulation, soil pathogens and organic matter management. One network of farmers in the study area has been focusing specifically on the monitoring, storage and exchange of GPS labeled information on soil quality indicators.